Many interesting recommendations added to my Requiem article this week. 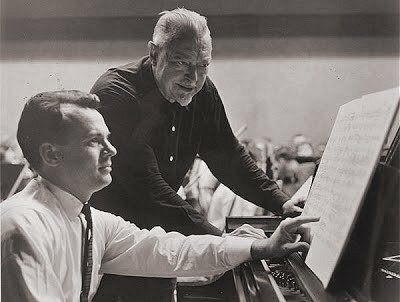 But we all overlooked one that is worth remembering - Howard Hanson's Symphony No. 4 "Requiem" (in memory of my beloved father). This 1943 orchestral work is in four movements, each of which are referenced to the Liturgy for the Dead. My article about Howard Hanson a while back also mentioned Erich Wolfgang Korngold, and he currently has a festival in his honour in London. Header photo shows Hanson standing with John LaMontaine. (Credit Fredonia Press). Now playing - Howard Hanson Symphony No. 4 with the composer conducting the Eastman Rochester Orchestra on Mercury LP SRI75107. The coupling is Walter Piston's Symphony No. 3. I also have the Arte Nova CD of Hanson's Fourth with David Montgomery conducting. But the composer captured on vinyl in inimitable Mercury sound wins on every count. Now read how precious this human life is. How nice to see Howard Hanson mentioned for the moving tribute to his father that is his 4th Symphony. Hanson is still denigrated in some quarters, but I second your opinion of this symphony. It is Hanson beyond reproach. Thanks for another interesting path. 'Hanson is still denigrated in some quarters ...' John, what you say is so sad, but also so true. Should it matter whether a composer is fashionable or not? Should it matter whether a composer is Chinese, Black, female or gay? All that matters is was their music good? Howard Hanson wrote beautifully crafted and very good music. As did/do Finzi, Howells, Lutyens, Creston, Alwyn, Dorati, Maconchy, Arnold and many, many more. They, and their peers, will continue to feature here, and be played on my radio programme. Irrespective of how the music police has judged them.